Many people think of minestrone as the kind of hearty fare best eaten in the cold weather months. Minestrone is wonderful in fall and winter, of course, but it can actually be enjoyed year-round, its component ingredients changing with the seasons, served hot in the winter, warm in the spring or autumn, and even ‘cold’ (ie, room temperature) in the summer. Like so many other classic dishes, there are practically as many minestroni as they are minestrone cooks. But almost all minestrone recipes begin with three ‘base’ vegetables: onion, carrot and celery. You will notice that these are the same three vegetables, referred to as odori in Italian, that go into the most common type of soffrito, or flavor base, for countless sauces, stews and soups. 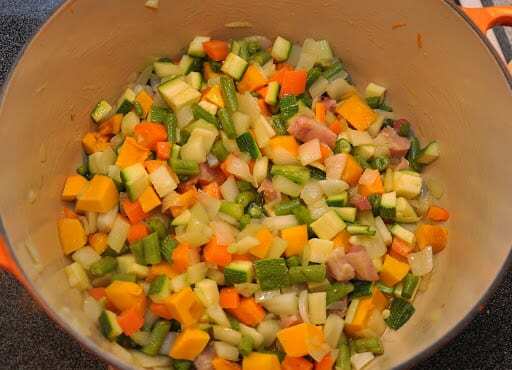 But while for most dishes you want a soffritto to dissolve into whatever it is you are making to provide maximum background flavor, and therefore you chop the vegetables very fine, here you want each component vegetable to retain its own identity, so chop the vegetables into smallish cubes. Step 1. You begin the minestrone with oil and/or butter in the bottom of a pot big enough to hold all your ingredients with room to spare. (Better too big than too small.) You want a generous amount of fat, for reasons that will become evident as you read on. Add onions first, allow them to rosolare (saute) without browning while you chop the carrots, then add the chopped carrots while you chop the celery, then add the celery. If you like, you can also add some chopped pancetta to this base–it adds a lovely flavor. Add a healthy pinch of salt, which will keep the vegetables from browning and bring out their flavor. You will keep doing this until all your odori have had a chance to cook and absorb the flavors of the oil and preceding vegetables. Step 5: Now you add one or more legumes: cannellini beans, borlotti beans, cranberry beans, peas, baby lima beans, fava beans, (occasionally) chick peas, etc. Here I am assuming that you are using canned, frozen or pre-cooked legumes. (If you are using fresh beans, then add them before you add the water.) Cook for another 20-30 minutes, adding more water if the soup is getting too thick–but the soup should actually be quite thick, more of a stew than a soup. In fact, I like t crush some of the vegetables against the side of the pot; the crushed veggies melt into the soup, giving it a thick and ‘smooth’ quality. Ecco fatto! You can serve the soup immediately, but it is much better made ahead and served the next day, or at least after a few hours’ rest. You can use of variety of ‘toppings’ to provide an extra flavor flourish to your minestrone: You can stir in grated parmesan before serving if you like, sprinkle it on top or serve it on the side. Pesto sauce is wonderful, too–a typical summer addition to minestrone–either stir it in before serving, or add a dollop on top of each soup plate, and let each diner mix it in to taste. Or, in a typical Tuscan style, just pour over un filo d’olio and a generous grating of black pepper over each soup plate before serving. As mentioned, you can serve it hot, warm or room temperature. You can also add pasta, rice and even chunks of bread (see ribollita below). Of course, pasta is more typically southern, rice more typically northern and bread is typically Tuscan. I usually cook the rice or pasta separately before adding it to the pot at the very last, letting it simmer a bit longer, but not too long, just before serving. If you are making it ahead, don’t add the rice or pasta (or bread) until you re-heat and serve, or it will become impossibly mushy. As mentioned, the choice of vegetables is almost infinite, according to your taste, what looks best at the market and the season. But there are some vegetables to avoid, in particular those that have a very strong flavor that would overwhelm the others: peppers, for example, or most hard cruciferous vegetables like broccoli or cauliflower. And, with one notable exception (see below), eggplant is not usually part of minestrone, either. Finally, while minestrone can be made totally vegetarian or vegan, it is often made with bits of pork, either cut up pancetta, prosciutto or pre-cooked pork rind (cotenne) for deeper flavor. In a pinch you can use crumbled sausage meat. Add the pancetta or sausage meat first to the oil, let it saute and then begin with the onion and proceed from there. Add the pork rind just before adding the water or broth. Broth gives it an even deeper meatier flavor, although personally I find this makes the soup too ‘heavy’. Minestrone alla milanese: pancetta, potatoes, tomatoes, spinach, savoy cabbage, peas, borlotti or cannellini beans. (Some recipes call for green beans.) Typically includes rice. 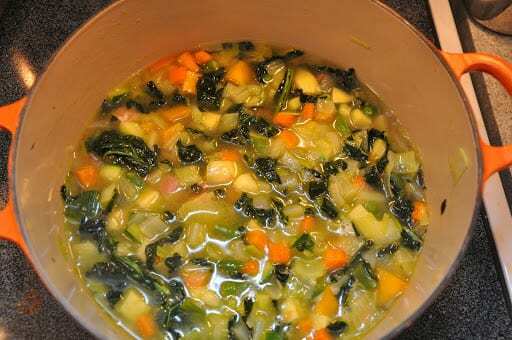 Minestrone alla genovese: One version calls for pumpkin (or butternut squash), beans, dried peas, savoy cabbage, potatoes, green beans, erbette (substitute baby spinach outside Italy), tomatoes. Another calls for potatoes, borlotti, zucchine, bietole (swiss chard), savoy cabbage, spinach and (very unusually) eggplant. Serve with pesto, of course! Minestrone alla livornese: fresh beans, spinach, prosciutto, savoy cabbage, a few swiss chard leaves, potato, zucchine, tomato sauce, pork rind (added just before the broth–not water). Minestrone alla pugliese: cabbage, green chicory, green beans, tomatoes, pork rind. Serve with short pasta (eg, ditali). 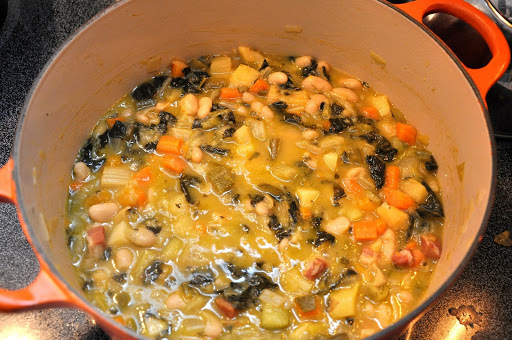 In Tuscany, they make a very special kind of minestrone called la ribollita: You make a ‘regular’ minestrone with cannellini beans, cavolo nero, savoy cabbage, potatoes, tomatoes, leek, swiss chard and pork skin (or substitute pancetta). You let that rest. Then when you are ready to eat (the next day) you reheat the soup (hence the name, which means ‘re-boiled’ in Italian), adding some water if too thick, and then chunks of Tuscan bread. Mix and allow to rest a few minutes before serving. This may be my personal favorite version, although the genovese gives it quite a run for its money. The basic recipe for making minestrone, the classic Italian vegetable soup for all seasons. An assortment of 'hard' seasonal vegetables of your choice, such as potatoes, green beans, zucchini, pumpkin and tomatoes, chopped into small but not tiny cubes. An assortment of leafy seasonal vegetables of your choice, such as savoy cabbage, escarole, chicory and spinach, cut into strips. Enough water or homemade broth to cover all the vegetables. One or more legumes of your choice, such as cannellini beans, borlotti beans, cranberry beans, baby lima beans, fava beans and chickpeas. Add a generous amount of oil and/or butter in the bottom of a pot big enough to hold all your ingredients with room to spare. Add onions first, allow them to sauté without browning while you chop the carrots, then add the chopped carrots while you chop the celery, then add the celery. If you like, you can also add some chopped pancetta to this base. Add a healthy pinch of salt. Add ‘hard’ vegetables in season, one by one, to the pot, allowing each ingredient to be well coated with the oil and absorb the flavor of all the vegetables that have preceded it. Add leafy vegetables that you want to, cut up into strips, proceeding as for Step 2 above. Add water (or broth) to cover, bring to a gentle simmer and allow to continue simmering for a good hour or more (most traditional recipes call for two hours of cooking), until all the vegetables are almost meltingly soft and the soup is getting quite thick. Add one or more legumes, either pre-cooked or canned. Canned legumes should be drained and rinsed beforehand. Cook for another 20-30 minutes, adding more water if the soup is getting too thick. As they simmer, crush some of the vegetables against the side of the pot. You can serve the soup immediately, but it is much better made ahead and served the next day, or at least after a few hours’ rest. Thank you! This is a practical and detailed explanation of making authentic minestrone in all its variations. And thank you for your comment, Gina! Sometimes trying a new recipe can be intimidating. The simplicity of the recipe and the step-by-step instructions helped me enormously. Putting each vegetable in separately really does make a difference. I made sure to sample it at various stages for “educational” purposes. Now that it is cooling in the pot I’m not sure if I can wait until tomorrow to eat it! Just getting started preparing this for the fourth Christmas in a row. This is an amazing soup that is fun to prepare in the “process” you describe. This year, to the base of onions carrot celery and pancetta, we will add butternut (pre-cut from Costco) patty pan squash, green beans, Yukon gold new potatoes, black kale, savoy cabbage, red chard, white and lima beans. The most amazing thing about this soup is the full rich flavor with no spices except a little salt. Thanks so much for sharing this. That’s fantastic to hear, Mark. Love that combination. Enjoy! Wow. I had to make a minestrone today and of course the first place that came to my mind for seeking advice was your blog. And I was right, great post! I am so happy to discover your recipe. My mother-in-law is visiting this weekend. She is fabulous and is a wonderful cook,100% Italian, need I say more? It is always a joy to cook for her but a little stressful as I only learned to cook when I married her son! Thanks for your comment, @Lou! If you try it, do let us know how it compares with your Dad's version. You know, there are probably as many minestroni in Italy as there are cooks. From my experience, they're all wonderful. Thanks for a great recipe! I'm looking forward to making it for my family. We have been craving an excellent recipe to minestrone the way my late father would have made it. He was from Abruzzo, Italy and his minestrone soup was always amazing. Unfortunetly he never left me the recipe. I will try yours and hopefully it will taste like my dad's. @quartz countertops: Yes, indeed, it really is quite easy if you just follow the steps! Thanks for your readership! Many thanks, it really looks delicious. And looks really simple to do. Thanks for sharing. memoriediangelina.blogspot.com is very informative. The article is very professionally written. I enjoy reading memoriediangelina.blogspot.com every day. Thanks so much for the kind comments. Happy cooking! A good chapter about minestrone, thanks! Thankyou! What a brilliant overview of minestrone! The favourite soup in our house all the year round!